I was recently cooking for a group of young Russian NGO – people. Vegetarian food was quite clearly a new concept for many of them, but the praise I got for my cooking was unequivocal. One of them even said in the feedback round that she shall now became vegetarian and convert her family and friends too! I was so happy to hear that since now I can think that besides some money for me, I may have achieved something much more important: actually a tiny little change in the world towards a more sustainable future. That felt like a great achievement for my fingers that were coarse from cutting veggies and legs that were trembling from too much standing up. Working in the kitchen, even if it is creative and fun, and a profession where you’ll be loved and praised much, is mostly a lot of hard manual labour. Since I’m no Michelin Star chef, I do my own dishes and chop my own veggies, and spent a lot of time lugging heavy bags from one place to another. For some reason, it is always these more than twelve-hour days you end up doing. By the way, if you want to become my slave, get in touch immediately! – Reserve enough time, and plan ahead: when one pot is cooking, can you make the salad meanwhile? How long does it take for each thing to boil or bake, and how long does it take you to chop the ingredients? A good cook can concentrate on several processes at the same time. – Learn to use your knife, and always bring your own. Generally, if you can chop fast, you should be able to cook for many people, no problem. I do like get some help, if I need to make a meal for more than 40 people and the time is limited. – It’s often hard to estimate how much people will eat. Generally, a meal should be about 300 g, though it depends a lot: men eat more than women, alternative people eat more than mainstream people, people who are active outdoors eat more than people who have spent time sitting in a meeting. – Usually, I estimate about 4- 5 dl soup as a single course, or for a meal 70 – 80 g grains or 150 – 200 g pasta and about 2 – 3 dl of curry or sauce, and about 2 dl salad. It doesn’t matter how you count, you can also multiply recipes or think how many potatoes each one will eat etc. The important thing though is that you do some kind of an estimation of the amounts that you’ll need, and plan the things on your menu. – Any kitchen often lacks these: a proper knife, a lemon squeezer and a hand held blender. – Don’t be shy with spices (there are a few exceptions though, like black pepper and cloves). – Afterwards, remember to enjoy the praise! 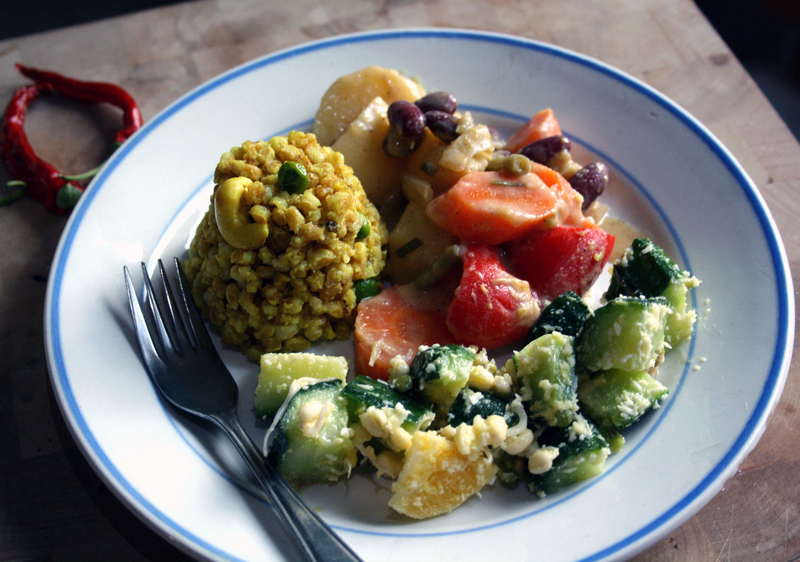 This is the kind of food that I usually make for people: quite a general vegetarian fare, but tasty and wholesome. The following recipes are by Tuija Ruuska, slightly modified, except for the salad which was a moment’s creation. The amounts are enough for 15 – 20 people. Start by chopping the onions and the chillies finely, and the potatoes, carrots and the bell pepper into big chunky pieces. 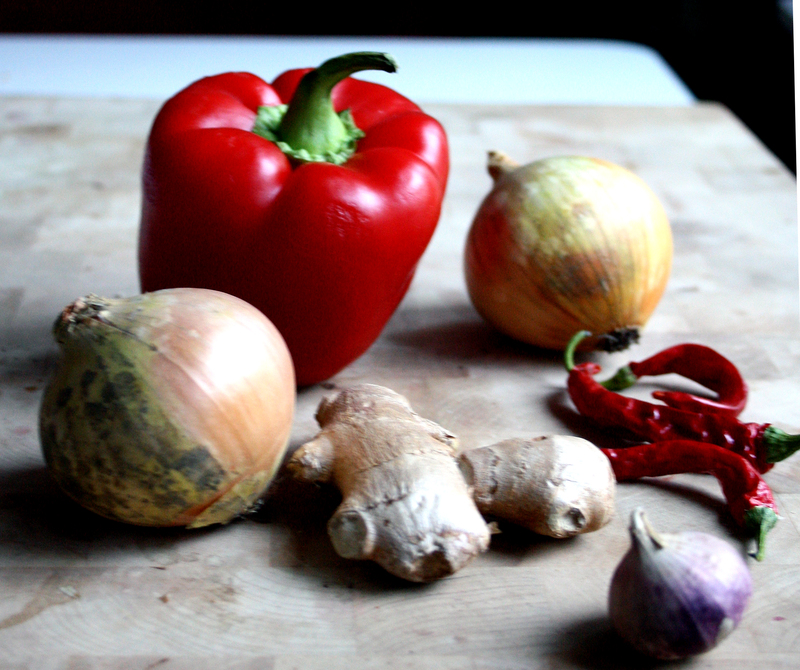 Add oil and the onions, chillies and grated ginger to big cooking pot, and fry until the onion is limp. Then add the chopped carrots and the potatoes, and enough water to cover them as well as salt, bring to boil and let simmer about 10 minutes. Then add the bell peppers and coconut milk, and let boil until everything is tender. As last add the mango puree, frozen and canned beans, lemon juice and allspice, and heat up once more. First cook the spelt. Two things about cooking grains: wash them first, to get rid of dust, and always add them to cold water that you then bring to boil, in order to avoid making porridge. So wash the spelt kernels first, generally it is good to change the water a couple of times and really rub the grain, as if you were doing laundry by hand. Then put the spelt, some salt and water into a big cooking pot. The water should come about 5 cm above the level of the spelt. Then bring it to boil and let simmer until the spelt is cooked, about 40 minutes. Meanwhile, toast the cashew nuts on a dry frying pan, turning constantly, since they burn easily. Then fry the onions in canola oil, together with the turmeric. Add the peas, the cashews and pour the mixture into the cooking pot with the spelt and mix carefully. First wash and cut the cucumbers, and cut up the orange and grate the zest. Mix the coconut, the grated orange zest, lemon juice and the oil and some salt with a blender. Mix the cucumber pieces, the orange, the mung bean sprouts and the coconut mixture. by any authorities and the veggies are growing beautifully. A week and a half ago there was a lot of lettuce, dill, mint, mangold and the first big zucchini ready to be harvested! I used the dill for a potato salad, the mangold and mint for mangold leaf rolls and made a nice lemony marinade for my half of the zucchini. There is some more information on our project in Globaali Piknik (in Finnish though). First I scrubbed the potatoes and cooked them in lightly salted water about ten minutes, until they were done. With new potatoes you should really use them fresh from the ground, because then you can actully scrub off all the peels, which didn’t happen now since my potatoes had been standing too long in the fridge. Then I allowed the potatoes to cool, chopped the other ingredients and made the dressing by whisking the oil, vinegar, mustard and spices together. Then I chopped the potatoes and assembled the salad. With potato salad it’s quite important to let it wait for a while before serving. I think potato salad is always good, but I this combination with salty capers, crunchy radishes and sweet apple is definetely my favourite at the moment. Mangold or chard is spinach – like vegetable, with big leaves ideal for making rolls.This time I used in the filling whole spelt kernels, but actually risotto spelt or any other “sticky” grain would be better, since it is easier to assemble the rolls if the filling sticks together. First I soaked the spelt kernels a few hours, and then cooked them in water about an hour, until they were done. Then I added the rest of the ingredients, the onion and the mint finely chopped and blended the filling well. The mangold leaves I prepared by cutting off the extra stem and flattening the rest of it with the edge of big knife, beacuse then it is easier to bend the leaf. Then I placed about a tablespoon of the filling at the other end of the leaf, folded over the sides and rolled a nice tight roll of it. The ready rolls I put on an oven plate and drizzled them with olive oil. I baked them in the oven in 200 °C about 20 minutes, until they were brownish. I cut the zucchini first into half moon shaped pieces, then I fried it quickly on a really hot frying pan in a generous amount of oil, until it was a bit speckled with brown. Then I squeezed the lemon and grated the zest, and mixed it with a bit of salt and sugar, and poured it together with the zucchini pieces. Then I let it cool down for about an hour before serving. The idea with this dish is that it should be extremely tangy, so use enough lemon!